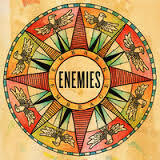 Wicklow based four piece Enemies follow up their universally praised debut album with a record that poses more questions than answers. Embark Embrace takes the precise guitar shapes and syncopated rhythms of Math Rock and fuses them with a less po-faced version of Post Rock instrumental music to conjure up with something that is refreshingly and uniquely their own. Perhaps mindful of the fact that the market for instrumental rock music is a pretty limited one, the addition of these guest vocal appearances could be seen as a tentative toe in the water, an indicator that the band might be considering a path where vocals become an integral feature of their sound. Certainly, the vocal chant of ‘Executive Cut’ turns a melodic instrumental into something more celebratory while elsewhere tracks like ‘Indian Summer’ are exuberant, genre-defying songs that stray beyond the rigid confines that sometimes made their debut seem a little narrow in focus. The band are obviously seriously talented musicians -the taut rhythms and complex guitar interplay at the heart of tracks like ‘Unit Shifter’ and ‘Love Unlimited’ demonstrate that talent to the full. There is a fluidity to this album that hints at a band confident enough to let these songs go where they need to go – the whole record feels like a tight knit group of musicians playing a series of extended, energetic jams. It will be interesting to see where Enemies journey to next – this is music ideally suited for the festival environment, but instrumental Rock music rarely connects with an audience in the same way as music with words that add that human, emotional side we can all relate to.